I am pleased to send you my Session Wrap Up e-newsletter. This e-newsletter features events and legislative activities from the Session Week of October 15, 2018. 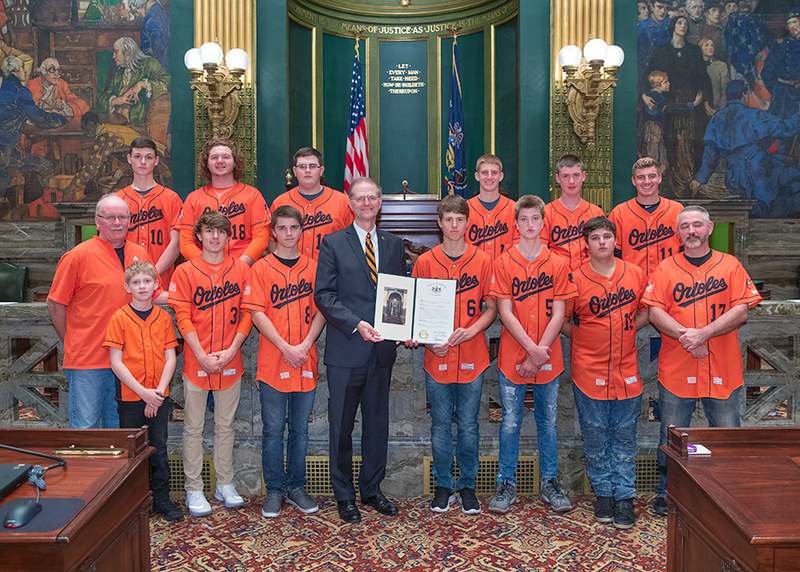 On Monday, I had the honor of introducing the Rocky Grove High School Orioles state champion baseball team from Venango County, to the Senate. The Orioles compiled a 10-3 regular season record on the way to winning the District 10 Championship. They capped off their stellar season by claiming the Class AA with a thrilling five-to-four (5-4) victory over Camp Hill High School on June 14. This was a truly historic event as Rocky Grove became the first District 10 baseball team to capture the Class AA crown. The Senate unanimously adopted my Resolution honoring the Sons of the American Revolution Day on Monday. The Joint Legislative Conservation Committee, which I chair, held and Environmental Issues Forum on Monday to examine ways to convert waste into renewable energy resources such as biogas and bioenergy. The concept of turning organic waste from areas such as landfills into energy has been examined extensively and has been found to offer a host of economic and environmental benefits. This energy will serve a multitude of purposes such as providing electricity and heat to homes and businesses across communities and generating fuel for automobiles. Many companies are expanding their energy portfolios with this waste-to-energy technology in order to improve waste management, reduce pollution and improve air quality. Legislation requiring insurance companies and Medicaid to reimburse emergency medical services agencies for services provided when care is rendered, but transport to a hospital does not take place, was sent to the Governor’s desk. House Bill 1013 ensures that EMS agencies are properly reimbursed for their services when called out to provide care. Currently, insurance companies and Medicaid are only required to reimburse EMS organizations for services when they include transportation to a hospital. The Senate Aging & Youth Committee approved two bills on Monday.